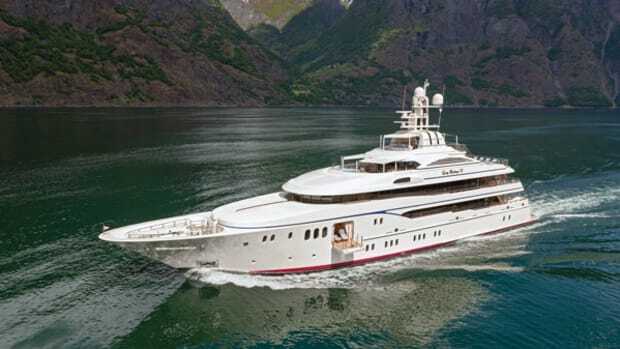 The late Jon Bannenberg's CORAL OCEAN, built by Lurssen, rivals superyachts of today. 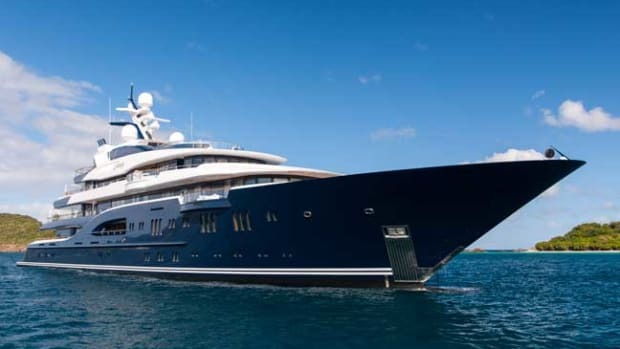 Until recently, 238-foot (72.5-meter) Coral Ocean, built by Lürssen Yachts in 1994 under the name Coral Island, was kept under a media ban. 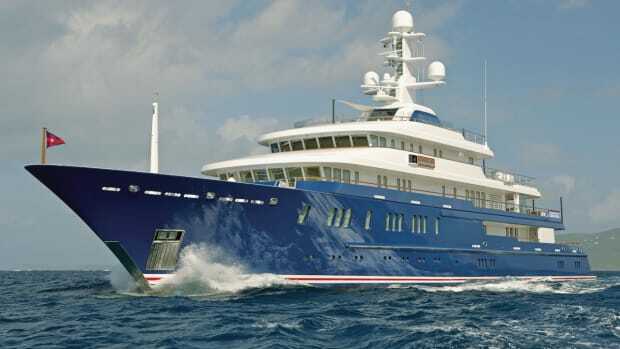 Now that she has changed owners and is on the charter market, we can tell you what it’s like to be aboard. 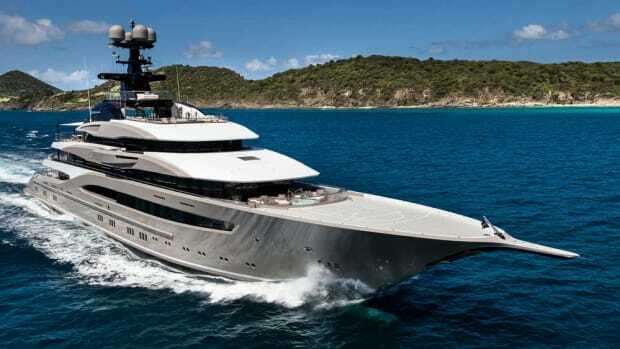 Designed by the late Jon Bannenberg, forefather of modern superyacht design, she is in immaculate condition and a masterpiece of workmanship and design that rivals today’s superyachts. Upon boarding her, I was immediately struck by her forward-thinking design elements. 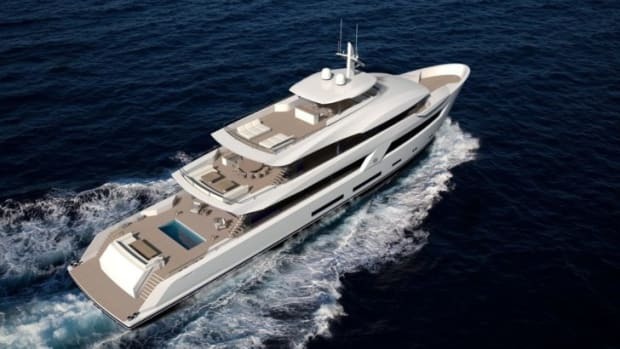 She has many of the amenities that we expect on 21st century superyachts. 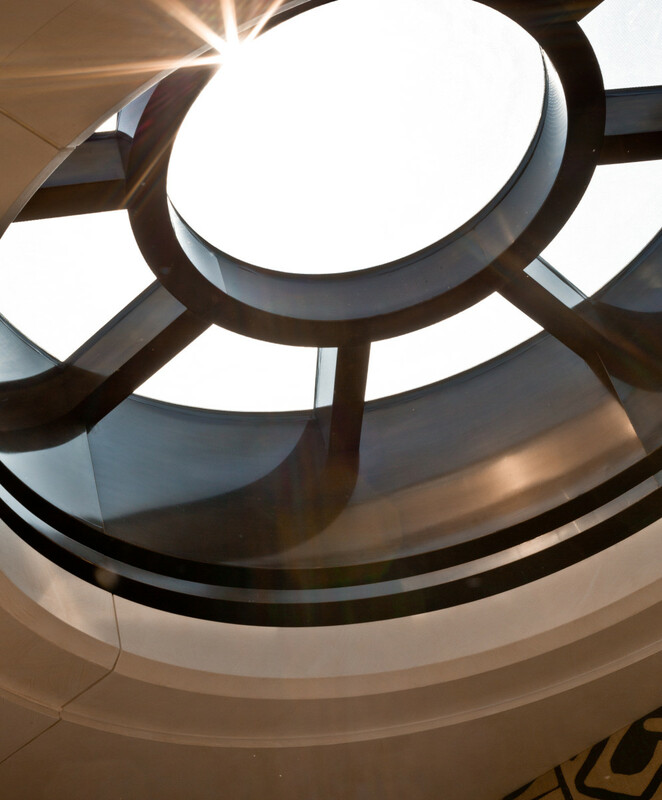 Bannenberg was ahead of the current trend of wellness areas, balconies, natural light from skylights and windows, countercurrent swimming pools, beauty treatment rooms, gyms and pop-up TVs. 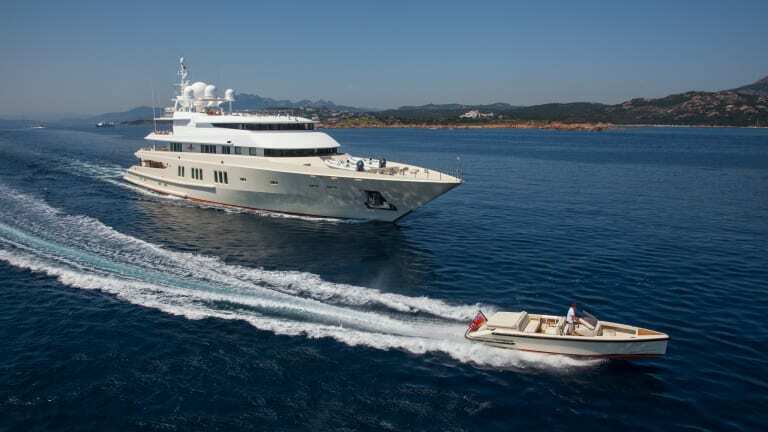 CORAL OCEAN, delivered in 1994, has a sporty exterior design and a surprisingly up-to-date and functional deck layout including a modern swimming pool on the sundeck. 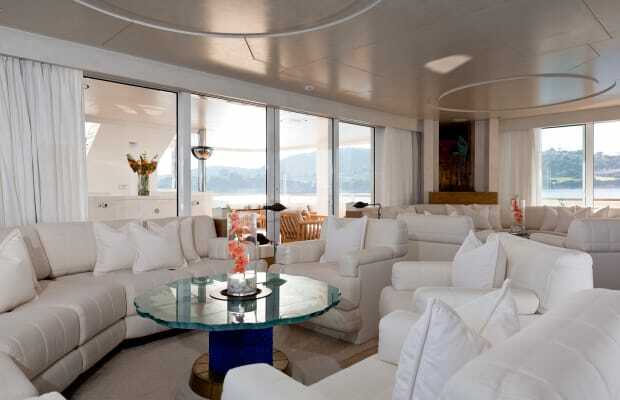 Her interior configuration is practical and flows well from room to room, as well as to outside decks. The layout invites a direct relationship to the sea and surroundings—a buzz phrase found in today’s design briefs. 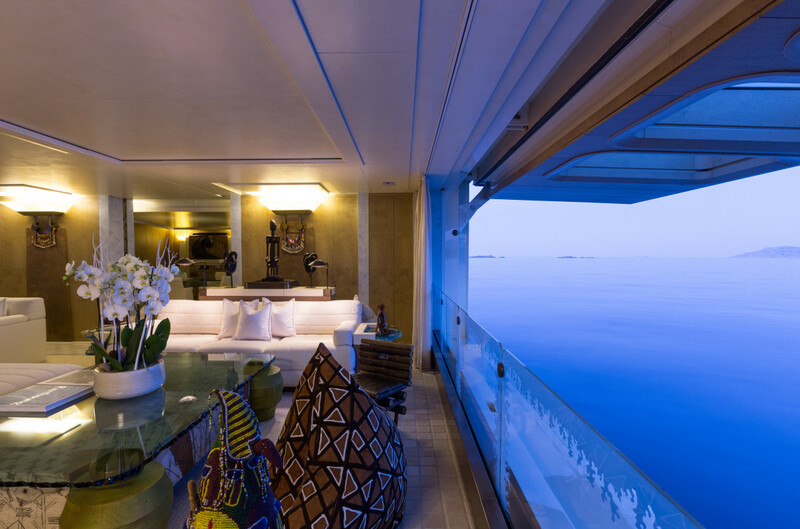 Wide, walkaround side decks enhance a sense of where you are on the yacht and allow up-close sea views. As is de rigueur today, she was laid out for crew to handily take care of guest areas via hidden passageways. Smartly placed pantries also provide convenience for dining service, an attribute deemed a necessity by today’s standards. Unusually striking is an outside, central flight of stairs that leads to the upper-deck circular cocktail bar. 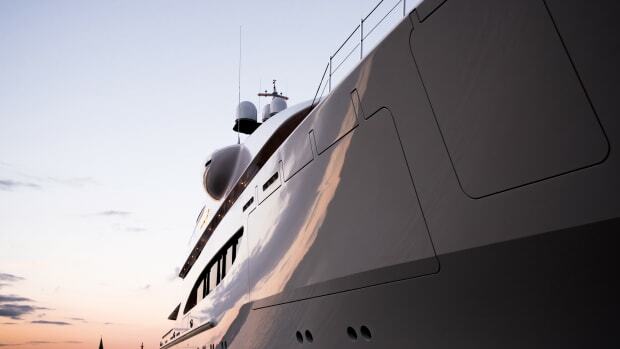 Avoiding the top-heavy “wedding cake syndrome” inherent in many multideck yachts, Coral Ocean’s voluminous interior is wrapped in an envelope of streamlined, sharp lines. She had a majestic feel from the moment I arrived. Unusually striking is an outside, central flight of stairs that leads to the upper-deck circular cocktail bar. This stairway is ideal for grand entrances and exits. While parties aboard could easily accommodate 100 guests, 12 overnight guests enjoy six staterooms: a VIP suite on the upper deck, four guest staterooms on the lower deck and an owner’s suite and lounge on the top deck. 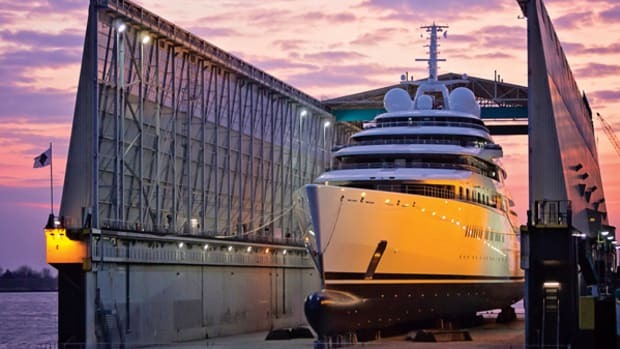 As with most of his 200-some yacht projects over a 30-year span, Bannenberg designed both Coral Ocean’s exterior and interior, so there is no sense of disconnect. Bannenberg deplored the moniker “stylist,” considering it a word more applicable to Vidal Sassoon than to himself. He insisted on being known as the designer of record, not the stylist. While her interior is not what you’d call modern, minimal or contemporary, her décor is fun, fresh and original, exhibiting an impeccable level of design detail. Coral Ocean’s interior décor, while eclectic, is cohesive in its colorful Polynesian beach house concept. Each space is replete with wood finishes, unusual textures, etched glass, custom and collected furniture, and striking ethnic, tribal and global accent pieces that Bannenberg curated. Many yachts from the ’90s now appear dated. Not this one. While her interior is not what you’d call modern, minimal or contemporary, her décor is fun, fresh and original, exhibiting an impeccable level of design detail. 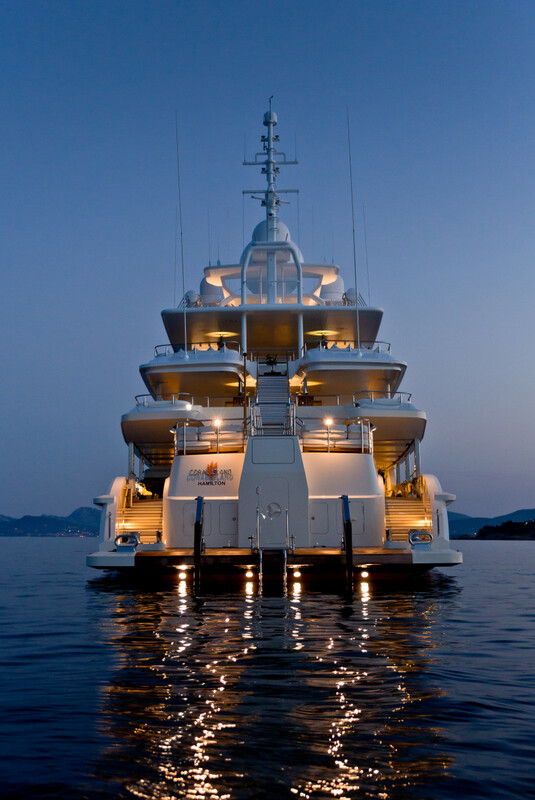 Bannenberg prided himself on providing every last item on a yacht. An owner could walk on board with merely a suitcase of personal clothes. 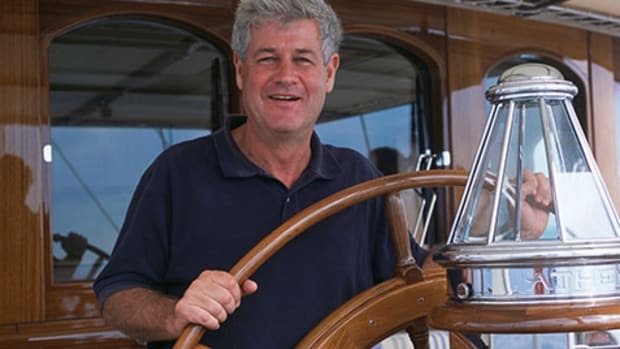 Back in the 1980s, when I first met Bannenberg, he talked about his “snail tongs list,” meaning that before a yacht’s delivery, he made sure not only that china and crystal were in place, but also that the correct implements such as snail tongs were aboard, should escargot be on the menu. Design elements such as skylights, indoor/ outdoor living spaces and a keen eye for mixing modern pieces with found objects and quirky art pieces add to Bannenberg’s success with CORAL OCEAN. 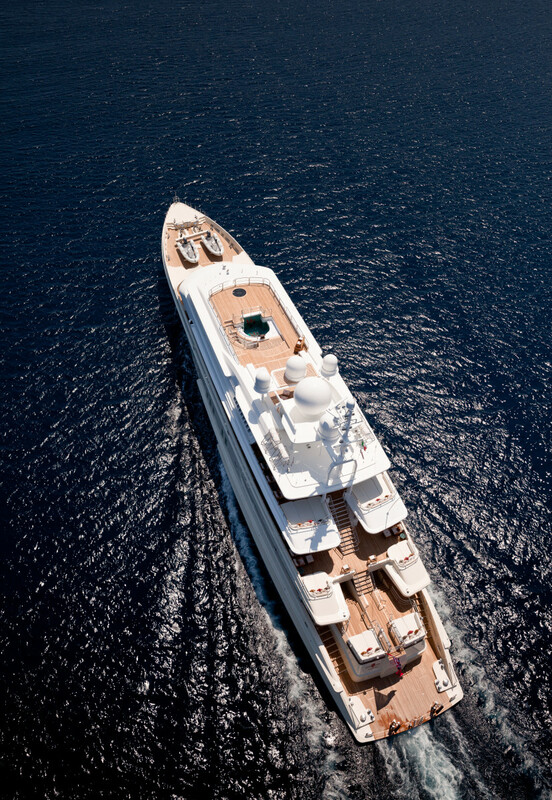 Coral Ocean just may have been the first yacht to have a dedicated spa, wellness area and gym complex with access to the wide swim platform where one could jump in the sea post-workout or choose an indoor steam. Another feature prevalent today is the cinema, and here, while there is not a dedicated one, the main deck salon has a projector with retractable screen. 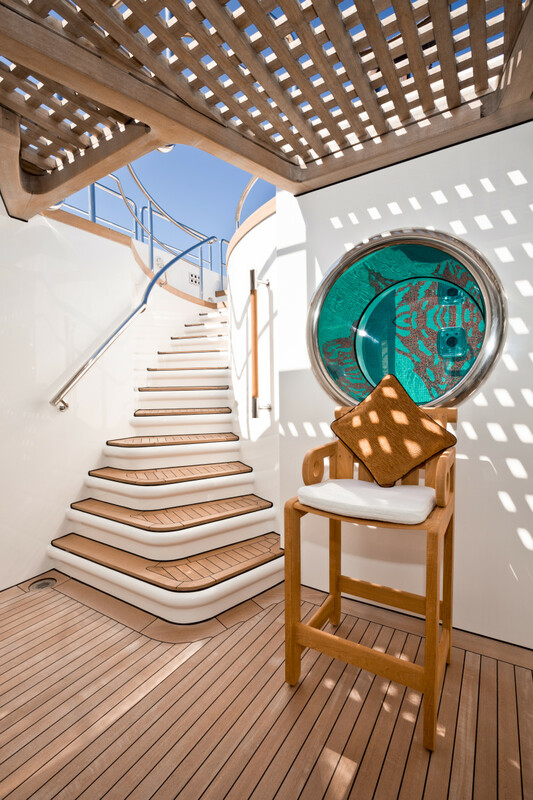 The biggest surprise in the salon is that the whole starboard side shell opens to create a balcony, offering guests an unimpeded view to the sea as well as a salt air breeze. Among the interesting textures Bannenberg included are wall coverings created from tree bark, silver leaf and burled birch, and tables made from granite, driftwood and concrete. Wood of many sorts is used in an unusual ways. Burled birch panels are adjacent to an oak parquet floor, and there are more custom pieces made from burled oak and parchment, and from mahogany. A bronze-sculpted waterfall cascades down an internal staircase from the top deck to the main deck. The focal point of the top-deck lobby, covered in eucalyptus wall panels, is a vintage slot machine with its own coins. Elsewhere, you can find elephant headgear from India used as wall hangings, beaded and woven objects, and tribal African masks. Bannenberg obviously had fun picking out the accent items and creating a virtual museum of wonders. 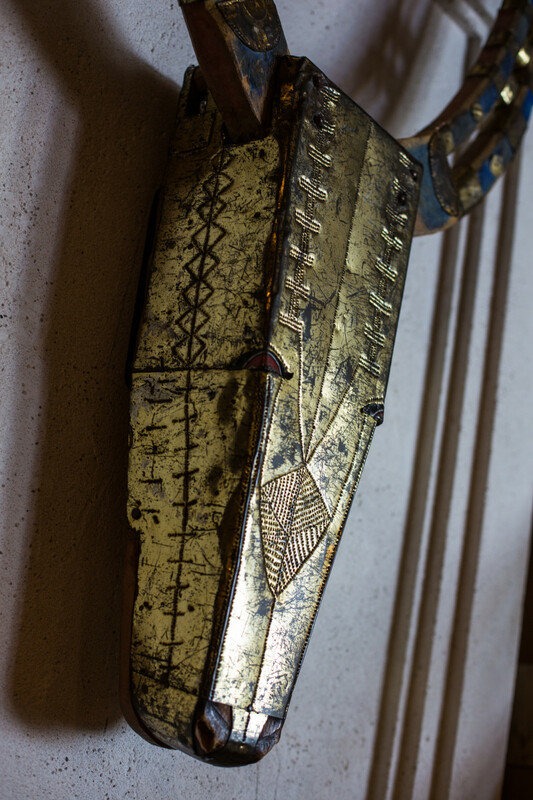 An African mask is one of the many art objects that adorn the walls of CORAL OCEAN. The owner’s suite is as modern as they come. 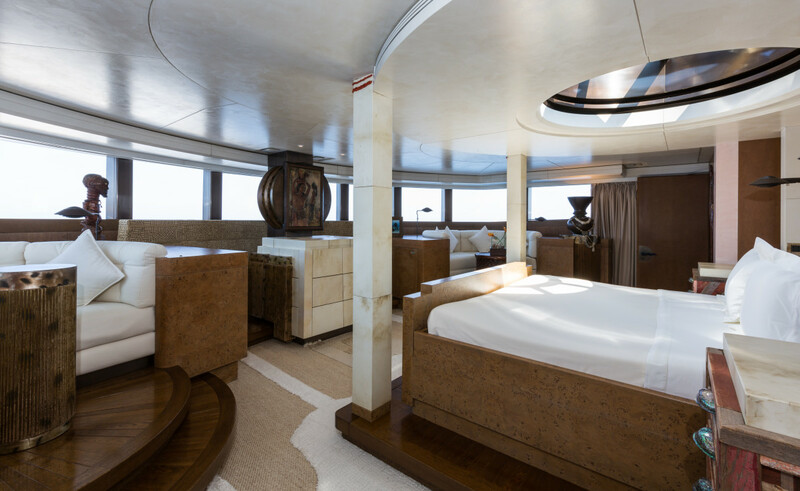 Situated on the top deck, the suite is split level, extending to the upper deck with dressing rooms and his-and-her bathrooms. In the bedroom, a skylight is above the forward-facing bed, which is electrically adjustable for height. The owner or principal charter client can have morning coffee while viewing the outside world through the panoramic windows. Bannenberg did not miss a trick. The master suite has a panoramic view facing forward and a bed that can be electronically elevated for a better vantage point. 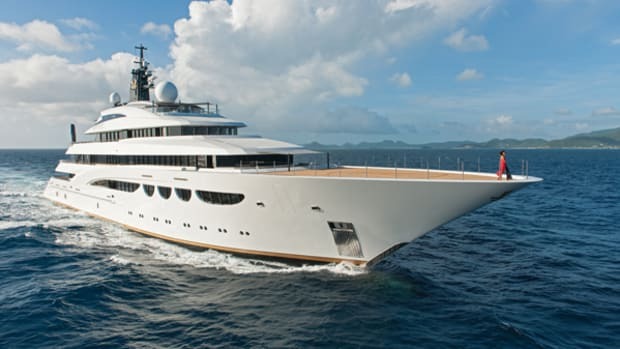 If the builder of some of the world’s most extraordinary yachts is “in,” then clearly Coral Ocean is yacht that truly stands the test of time—even for the most discerning of buyers.